The minimum-wage increase President Barack Obama proposed in his State of the Union address this week—$9 per hour by the end of 2015—should be a dog-bites-man headline. It is a no-brainer. It would directly affect the lives of millions of the lowest-wage workers—mainly poor, single mothers and workers of color in service industries such as fast food restaurants, hotels, hospitals, and nursing homes—by giving them an average wage increase of about 10 percent. A hard day’s work deserves a fair pay, and the proposed minimum-wage increase moves low-wage workers a step closer toward that reality. 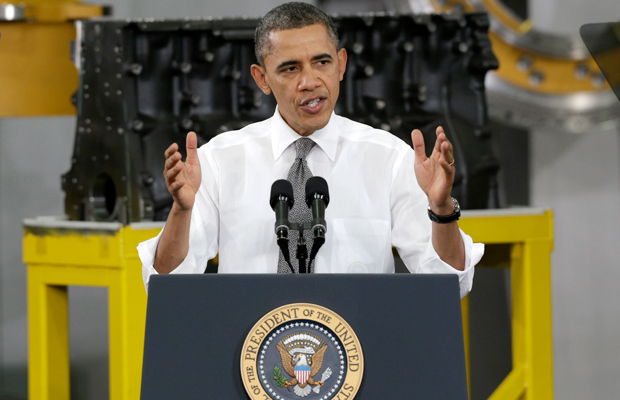 Business lobbyists and conservatives, however, will quickly line up against President Obama’s proposal. The National Federation of Independent Businesses, for instance, flat out opposes any increase in the federal minimum wage, believing that “Mandatory minimum wage increases end up reducing employment levels for those people with the lowest skills.” And House Majority Whip Kevin McCarthy (R-CA) suggested on the day after the State of the Union address that the proposed minimum-wage increase would hurt job creation and thus harm the economy. There is no evidence to support the claim that a higher minimum wage will lead to less employment. Businesses can easily absorb a higher minimum wage—with a small price increase or a small reduction in already very high profits, for example. The argument that a higher minimum wage will be a job killer simply doesn’t pass the sniff test of basic economic arithmetic, and is contradicted by reams of serious economic research. An increase in the federal minimum wage from its current rate of $7.25 per hour to $9 per hour by the end of 2015 will raise hourly earnings for about 21 million people. These are—by definition—the lowest-paid workers in the economy. Their total earnings amounted to 1.6 percent of the entire economy in 2011, the most recent year for which data are available. Minimum-wage workers can expect an average increase in their annual earnings of 11.2 percent if President Obama’s proposal is enacted. A very small price increase—stemming from businesses charging more for all goods and services in the economy—by 2015 will easily help pay for the solid wage increase of the lowest-paid American workers. Assume that the minimum wage would start rising in June 2013 and that the new minimum wage of $9 per hour would go into effect by December 2015. It would then take a price increase of at most 0.18 percent—the product of a 1.6 percent share of the economy for existing earnings for affected workers, times an 11.2 percent annual earnings increase—spread out over two-and-a-half years to pay for the entire minimum-wage increase. Prices would have to rise 0.21 percent each month—instead of 0.20 percent per month as they had for the two-and-a-half years from June 2010 to December 2012—to pay for the entire minimum-wage increase. The increase in price gains—inflation—as a result of helping tens of millions of low-wage workers is negligible because the proposed federal minimum-wage increase is relatively modest in absolute terms, and because the total earnings of low-wage workers are small compared to the size of the U.S. economy. Businesses could also give up some of their handsome profits to pay for the minimum-wage increase. Profits of nonfinancial corporations rose by 124 percent from their trough in December 2008 to September 2012, the latest quarter for which data are available. The entire minimum-wage increase—averaging 11.2 percent for current workers affected by the minimum-wage raise—would have amounted to just 2.4 percent of annualized nonfinancial corporate profits in 2011. U.S. businesses would remain immensely successful, even if paying a higher minimum wage affects their bottom line. Our calculations show that prices would have to rise modestly and profits would have to fall a tiny bit to accommodate President Obama’s minimum-wage proposal if these are the only avenues for businesses to address the higher costs. But economic research shows that businesses will also see a number of gains that will offset the higher costs. These gains include greater productivity, less labor turnover, and more customers. In other words, our calculations of the minimum-wage increase impact on prices and profits are overstating the effect of a higher minimum wage on businesses. There cannot be a negative employment effect from a higher minimum wage if businesses do not have to absorb higher costs. Straightforward calculations based on publicly available data expose minimum-wage opponents’ arguments for what they are: pure scaremongering that have no basis in reality. Businesses can easily absorb modest wage gains for their lowest-paid employees. Their costs will not increase and thus employment will not fall. Don’t believe the hype from conservatives and business lobbyists—the data clearly show that the minimum-wage increase will not hurt U.S. businesses. Christian E. Weller is a Senior Fellow at the Center for American Progress and a professor in the Department of Public Policy and Public Affairs at the University of Massachusetts Boston. Nick Bunker is a Research Assistant with the Economic Policy team at the Center. Authors’ calculations based on: Bureau of Economic Analysis, National Income and Product Accounts (Department of Commerce, 2013); Center for Economic and Policy Research, “March CPS Supplement,” available at http://ceprdata.org/cps-uniform-data-extracts/march-cps-supplement/. Authors’ calculations based on: Bureau of Labor Statistics, “Consumer Price Index for All Urban Consumers” (2013). These numbers reflect non-inflation-adjusted increases since the minimum-wage increase would not be tied to inflation either. Authors’ calculations based on: Board of Governors, Federal Reserve System, “Release Z.1 Flow of Funds Accounts of the United States” (2012).